Popular with people of every fitness level. The Lehigh Gorge Rail Trail offers trail options to suit everyone’s needs. 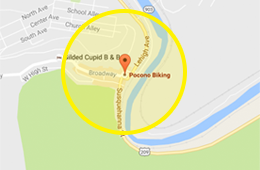 This enjoyable ride provides a gentle downhill, scenic, state park maintained path that follows the Lehigh River. Not only can you come for an hour or two, you can also join us for a full day. Pair a Pocono Biking adventure with an overnight stay in historic downtown Jim Thorpe. Convenient access points allow for one way rides up to 36 miles. Our two and four day overnight getaways offer up to 138 miles of trail through the D&L National Heritage Corridor. 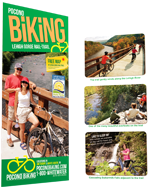 Below you’ll find descriptions of our most popular biking trail choices and bike shuttle service information. Check out your trail options and give us a call at 1-800-Whitewater (1-800-944-8392) to reserve your adventure today!